General recommendations to travellers on what to eat & drink in Mumbai. Mind what you eat. If you are not used to the pre-cooked street food or have a sensitive stomach, eat only food that is cooked (and hot), fruits that can be peeled, steamed South Indian food etc. Carry wet wipes or hand sanitizers. 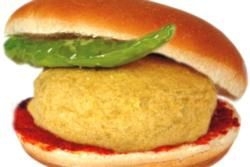 Vada Pav has an iconic status and is a staple food of Mumbaikars. It is available everywhere in Mumbai. Rich & famous anyone can be spotted eating it at roadside food stalls. But be careful, because the oil used can be reused several times. It is advisable you drink bottled water or filtered water. Do not drink tap water or from any unsealed water bottle, because it may cause severe stomach problems & can ruin a trip. The street stall food in Mumbai is mouth watering and dirt cheap, do try it. Mumbai has some of the best restaurants that serve a wide variety of food with all hygienic standards. You can choose from Gujrati Thaalis, Parsi Food, Muslim Kebabs, Mangalorean Food, North Indian Food, Sea Food and Goan Vindaloo Dishes to name a few.